A burglar was caught when a Facebook appeal led to the discovery of CCTV footage of him walking down the street with a stolen laptop. Career crook Darren Maulkinson was jailed for three years over the raid at the house on Ivy Street, Eastmoor, Wakefield. Leeds Crown Court heard the homeowner received a call from police at 2.45pm on September 24 last informing her that her house had been broken into. Maulkinson managed to get into the property through the porch roof. The victim posted an appeal for anyone with CCTV footage of the incident to contact her. The court heard the appeal led to the woman being sent footage of a man walking away from the property holding a laptop. A number of people then contacted the victim giving Maulkinson’s name. The court heard Maulkinson, 40, had been to homes nearby to ask if he could charge the laptop. He also told people he was going to sell the laptop at a Cash Converters store for £30. Maulkinson, of no fixed address, denied the offence when he was arrested but later pleaded guilty to burglary. The court heard he has 40 previous convictions, including many for burglary. Michael Collins, mitigating, said Maulkinson had been addicted to drugs for 20 years. 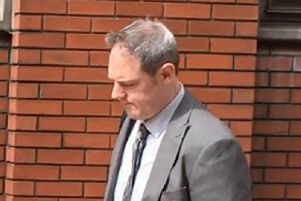 Mr Collins said Maulkinson accepted he would be jailed for a lengthy period of time because of his previous offending. Sentencing Maulkinson, Recorder Tahir Khan, QC, said: “You clearly understand the devastating affects that burglary can have on people.